Nurse Elizabeth Neal and her husband, Martin live “in the middle of nowhere” in sunny Devon so their location is ideal for solar power. 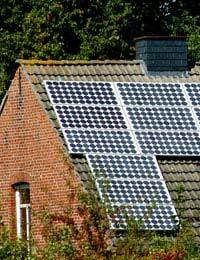 But the Neals certainly couldn’t be described as a ‘typical’ solar power household. While most families use it alongside traditional electricity, the Neals have no mains electricity supply. They produce around half of their own electricity from photovoltaic panels and a small wind turbine – and have a diesel generator to provide electricity when solar power isn’t available. They also have a Solartwin solar panel which provides a lot of their hot water and chose it because the pump it uses is solar powered rather than electric. Unfortunately, unlike many people who install a renewable technology, they can’t “sell back” any excess power produced to the National Grid because it would cost them around £30,000 to get connected to mains electricity. The couple buy 1000 litres of red diesel every year, at a cost (in 2009) of 46 pence per litre but it’s important to remember that when calculating the costs of any alternative power, you need to take into account the investment needed for purchase and/or installation of the technology. The diesel generator is expensive to run so it’s important that they use it only when really necessary. In summer, it’s in use for an average of an hour per day but this rises to around six hours per day in winter. “The Solartwin panel is excellent for our hot water needs,” said Elizabeth. “I’d say the water coming from the tap is hotter than the water you’d get from a gas water boiler unless you had it turned up very high and obviously for us, one of its major benefits is that it doesn’t need any electricity. Obviously, solar generation stops as soon as the sun goes down but they can store excess power produced on a sunny day in three leisure batteries, such as those used in caravans – and when that isn’t sufficient, they switch on the diesel generator. The fact that they don’t have mains power affects the way the Neals use their appliances. For example, Elizabeth wouldn’t dream of switching on the generator just to use the washing machine. She would put the washing in when she was switching on the generator for another task such as using the vacuum cleaner. “Overall, I think our solar panels and wind turbine probably reduce our reliance on the generator by at least 50%,” says Elizabeth.